Note: This review was initially published on the Moment Magazine official site on 10/11/16. Denial is an astonishingly accurate adaptation of the famous 2001 court case Irving vs. Penguin Books Ltd. In this case, renowned historian Deborah Lipstadt stood trial against David Irving, an infamous Holocaust denier. After Lipstadt called Irving a Holocaust denier, falsifier and bigot in her book Denying the Holocaust, Irving accused Lipstadt of libel. This case came to fruition due to the British legal system, which requires those accused of libel to prove their innocence—the opposite of the legal system in the United States. The movie portrays the struggles, and eventual triumphs, of Lipstadt and her legal team in their battle against pure hate. As a Jew with multiple grandparents who are Holocaust survivors, I have an inherent emotional connection to this case—and in turn, this film, which I saw at the United States Holocaust Memorial Museum’s premiere screening. Following the film there was a discussion with Deborah Lipstadt and the producers Russ Krassnoff and Gary Foster. The sheer amount of historical detail incorporated by the filmmakers was astounding. The producers pointed out a perfect example of this meticulousness during the question-and-answer session; the head of Lipstadt’s legal team, Richard Rampton (Tom Wilkinson), never made eye contact while addressing Irving (Timothy Spall). A factual detail so easy to abandon would never make it into the screenplay of a generic blockbuster hit. “Deborah said, ‘I’m about to sign this paper giving you these rights. You need to promise me one thing: the truth,’” Russ Krasnoff, one of the producers, explains. “It was our mantra.” In other words, a painstaking dedication to portraying the truth was one of the Denial team’s core values. The producers explained that this pursuit even extended to having Lipstadt on the set, in order to make sure everything was accurate from her point of view. 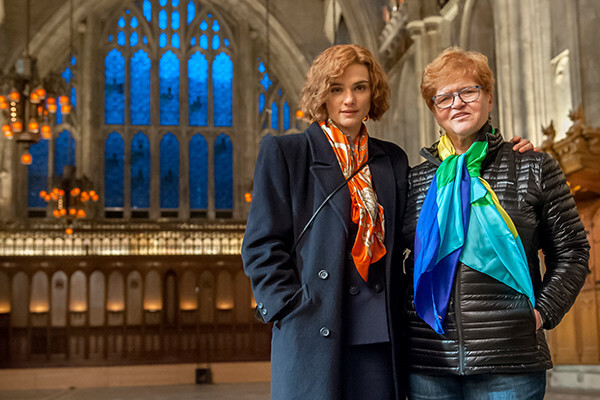 Lipstadt’s story is about the dedication to truth—and the filmmakers took her lesson to heart. “Every single word that David Irving says in the film… it was all taken from transcripts or interviews,” says Krasnoff. “Every word was documented.” This was astonishing to me. Some of Spall’s lines were so shockingly ignorant and hate-filled that I assumed they had to be exaggerations—like Irving’s “No holes, no Holocaust” diatribe. However, I came to realize that the over-the-top nature of these deliveries only proves Spall’s skill in accurately portraying such a sinister person. The film’s realism was only bolstered by outstanding performances from Rachel Weisz and Timothy Spall, who flawlessly portrayed opposing forces in what might be their best roles to date. The support and fondness I felt for Lipstadt also extended to Weisz, who was able to transform expertly into the historian over the course of the film’s nearly two-hour runtime. Timothy Spall has always been excellent at playing fictional villains; his transition from fictional evil to real-world evil was seamless. Where the illusion of realism that drives this film was somewhat shattered was with actors Tom Wilkinson and Andrew Scott, whose performances sometimes felt unnatural. There were also occasional shots that either lingered too long, or placed emphasis on subjects that should not have been emphasized, which was a bit jarring for me. A large portion of the Q&A centered around the idea that whenever there is a tragic event in history, there will always be people who find a way to deny it. Whether they are anti-Semitic, racist, or simply in need of a selfish way to cope with said tragedy, they exist. With so many horrific events occurring on a near-daily basis throughout the world, there will always be those who seek to undermine the truth. They cling to tiny details, minuscule inconsistencies, and blow these details up to horrendously large proportions in an attempt to prove their opinions. However, Lipstadt, her legal team and the filmmakers prove that, whether it be the Holocaust or any tragedy, the truth will always prevail.